The Islamic month of Shaban 2019 to be on 6th April and the Shab e-Barat will be observed on the eve of 20th April in Pakistan. The Islamic month of Shaban 1440 Hijri is all set to begin on 7th April, 2019. Central Ruet-e-Hilal Committee will chair under the leadership of Mufti Munib-ur-Rehman today to watch the Shaban moon. 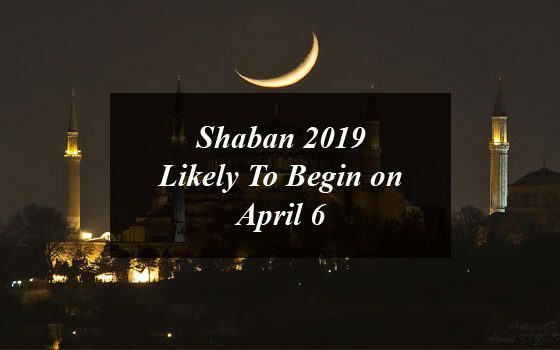 If Shaban moon 2019 sighted in Pakistan today then the 1st Shaban will begin today on 5th April and if the Shaban moon is not sighted then the 1st Shaban will begin on the eve of 6th April, whereas the 7th April will be the day of first Shaban. The official announcement about the beginning of Islamic month of Shaban 1440 Hijri will made by Chairman of the Central Ruet-i-Hilal Committee, Mufti Munib-ur-Rehman, after chairing the meeting of the committee. Shaban is the 8th month of the Islamic year. The Islamic year 1440 started with 1st Muharram on 12th September while the 10th Muharram 2018 was on 21st September in Pakistan. Shab-e-Barat 2019 will be observed on the eve of 20th April in Pakistan. Shab e-Barat is to be celebrated on Saturday the night of 20th April and 21st April will be the day of Shab e-Barat. Shab e-Barat also known as Mid-Sha’ban or Bara’at Night will be celebrated all over the world on the evening on 15th Shaban, which symbolses the central point of the Islamic month of Shaban. Shab e-Barat is the night of forgiveness or Day of Reparation. The month of Shaban this year started on 6th April, and the 15th Shaban will be on Saturday, 20th April, 2019. Shab e-Barat aka Laylat al-Bara’at in the Arab world, it is regarded a night when Allah showers His blessing and pardons the sinners. It is also considered as the evening when fortunes of the people are decided for the coming year. Muslims all across the world celebrate Shab-e-Barat with great zeal and devotion to seek Allah’s forgiveness and blessings. They also hold special prayers in mosques to seek Allah’s forgiveness at night also visit the graves of their loved ones and will pray for their eternal peace. In Muslim countries families prepare special foods like rice, halwa and deserts to distribute among poor. After the Shaban, the holy month of Ramadan begins in which Muslims keep fasts. Ramadan is the 9th Islamic month and this year it will begin on the evening 6th May, and will end in the evening of 5th June, and Eid-ul-Fitr will be on 6th June, 2019. There won’t be the public holiday on Shab e-Barat but it will fall on the evening of Saturday 20th April, so there will be automatically official holiday in Pakistan and that is Sunday. 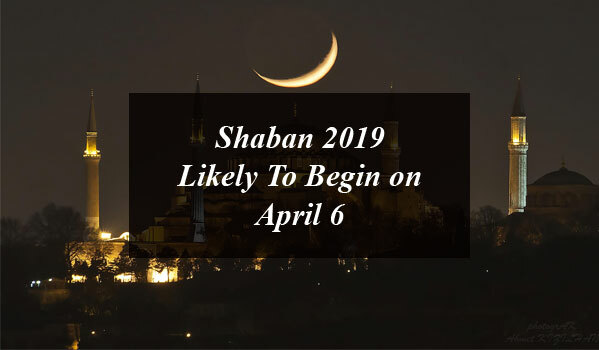 Shaban 2019 Likely To Begin on April 6. The Islamic month of Shaban 2019 to be on 6th April and the Shab e-Barat will be observed on the eve of 20th April in Pakistan.